While you're there, disconnect the end links and road test. That'll allow you to narrow it down. I R&R'd the end links and it made no difference. Then I lubed the sway bar bushings with Wurth HHS-2000, and that did it. I spent quite a bit of money at the dealer doing repairs in trying to find the cause to exactly the noise the original poster described (upper control arm ball joints, lower control arm ball joints, both lateral arms, etc.). Each sequential job required a $120 alignment each time, so didn't make me the least bit happy. The Wurth HHS-2000 grease sprayed on the sway bar bushings helped quell the noise, but in the end, it needed a new sway bar (which has the integrated, non-replaceable sway bar bushings on them). As DVC mentioned (and also an indpendent mechanic suggest I do, as I stopped going to the dealer), have your mechanic disconnect the sway bar end links to the sway bar, so it takes pressure of the sway bar bushings. Test drive it around over a rough patch of road or over expansion joints to try and replicate the noise, and if the noise disappears, you know it's the worn sway bar bushings. You'll then need to get that sway bar replaced with a new one so you have fresh bushings on there. Good luck. Is it possible to source the hhs 2000 locally from a store or must it be ordered? When I had my sub frame out for paint and maintenance I put a couple layers of bicycle inner tube under the sway bar clamps as prevention to keep them tight. If the rubber is still stuck to the sway bar it might work as a temporary cure to tighten them up. The reason you can't use urethane bushings to cure this issue, is there is nothing to keep the sway bar centered side to side as the urethane wouldn't be vulcanized to the sway bar. Two titanium or aluminium shaft collars could solve that problem. One on each side to keep the sway bar in place. It's for the HHS-Plus, which superseded the HHS-K, which superseded the HHS-2000. Didn't know it was vulcanized rubbber onto sway bar. I will remove sway bar end links first and see what happens. Maybe its the power steering bushings also who knows. We'll see. Will try that Chris Thanks! Will lithium greese spray work? it seems very sticky and has high pressure with the red straw. On road motorcycle chain lube would be better, any motorcycle shop. Anything will work temporarily, but it is more for squeak than rattle. Max, I R&R'd my front end today. Control arms (both of them), endlinks, bushings, steering rack bushings, upper/lower ball joints. ... now I have ABS/ESP/Active Lights Unavailable up on the dash. How hard is it to do the steering rack bushings? If i were to do them over again... 40 generous minutes. 3. Remove 4 - 20mm (I think that's what they were) bolts that protect the steering rack AND mount the rack to the body of the car. 4. Lower rack about and remove old bushings. I found it easier to pry the lower ones out, and then use a screwdriver or something to push the top ones out. 5. Install new bushings. Take care to note orientation. You'll see what I mean. 6. Lift rack back up into position. 7. Align protective plate, and put the 4 bolts back in. 8. Put panels back. Lower car. Figures 8-10 in here. Nothing else needs to be disconnected. There's just enough room to drop it about an inch to squeeze the top bushing in. Last edited by mkiv_tdi; 04-18-2016 at 03:14 PM. Awesome, so you can move the rack enough without unbolting the tie rods or changing the alignment? Yep, it'll just come down about an inch. That's all you need. Whether or not that changes your aliment a teeny tiny bit due to having fresh bushings in there, I don't know.. This was inspired by the C-Class guys. I figured ours couldn't be much different. You're the man! Congrats. Ahh you did the steering rack bushings! Cool I just ordered mine and said WTH. It's 10 years old might as well change it, they cant be in that good a shape. I'm going to swap out my steering rack bushings and take a look at my sway bar while we're in there. Got the lube ready for sway bar too. OK so wait, you did control arms or thrust arms?? Control arms hold the air springs up. Thrust arms go front to back and are aluminum. End links to steering rack? Just end links or did you replace the middle shafts too with the new boot etc? Last edited by Max.H; 04-19-2016 at 12:19 AM. And upper/lower ball joints. And sway bar endlinks. Let me know if you have any questions. On a DIY scale of 1-10, it's probably a 6 if you're working by yourself, only because some of these things can be heavy when you're on your back. Everyone needs a lift! Best purchase I have ever made. im in the same boat as you guys, ordered the bushings, wurth, as i have that annoying knock when i yank the wheel and the steering wheel seems to float left to right when i hit uneven pavement. already did inner/outer tie rods, control and thrust arms, all lower/ upper ball joints, bushings, bla bla bla bla,and a alignment ... which looks like i will need to get another after the bushings.... also might replace the power steering fluid. just want the thing to drive the way it should after all this work lol. It might. It might be too thick though, won't hurt to try. The Royal Purple synthetic stuff definitely worked and was easily available, and people are having luck with the Wurth oil too so I'd try and grab one of those if you can. Good luck! So, you did it all as well. Now just the steering rack bushings there are 4 of them. So, is that what you will be doing next or greasing the sway bars? I'd do both. These cars are old and need love. GL! Let us know if it gets rid of that noise. Wow, nice garage! 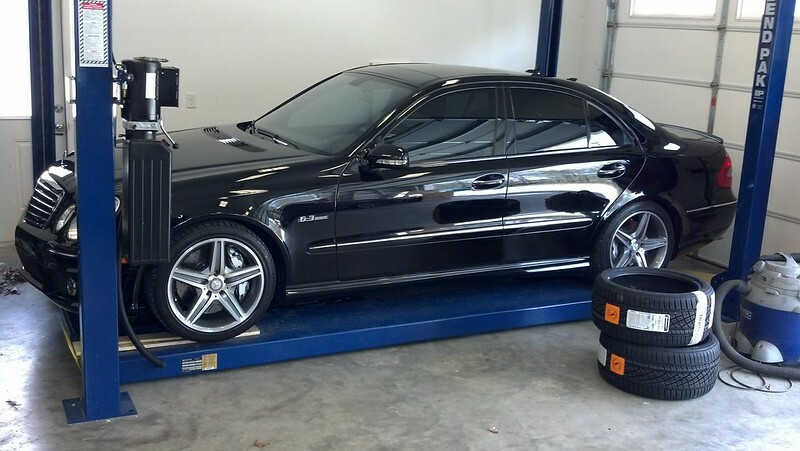 I was thinking of one like that but a scissor lift that goes between the tires so I can work on suspension as well. Thanks!! I plan on putting a second lift in as well I have the jack accessory that slides front to back on the inner rails. I can use it to lift the front or rear of the car with ease. Almost like having a hybrid 2/4 post. I am curious if the wandering you guys report is unrelated to this issue. I have always had tramlining in every single car I own with staggered wheels. And given our cars are more performance oriented, the slightly more aggressive alignment could certainly contribute that. My car had excessive tramlining when I first got it but an alignment really helped to minimize the effect. just waiting on the 4 bushings now, tracking says tomorrow. I do have a small clunk when i turn the wheel as far as it goes and then give it a quick jerk back and fourth but my problem isnt really the noise. after replacing ALLL the front end wear items i still have a shimmy at highway speeds. if i hit uneven pavement with one tire the steering wheel slowly seems to shimmy left to right. kind of like each wheel doing its one thing? idk , i feel like ive been spending most of my time working on the car doing maintenance trying to get it to be perfect again vs actually driving it . lol wosrt part is i only have 66k on it. to top it off i am pretty sure i have a leaking rear shock or failing bushing in my right rear as well. never ending with this car. I'm glad that this is working out for everyone. Just remember to get the alignment done after touching anything suspension related.